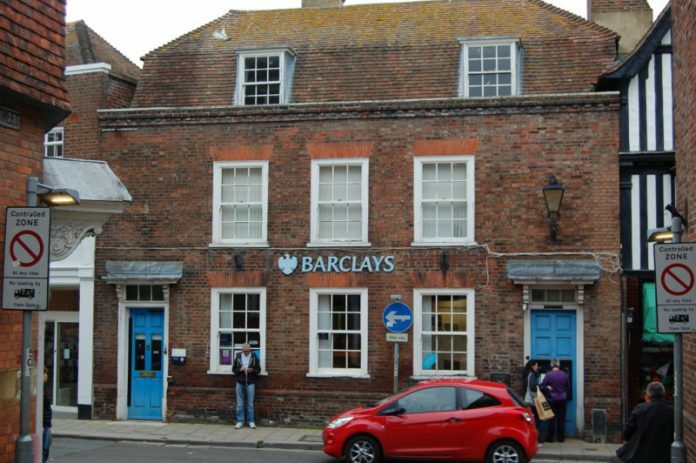 After the closure of HSBC, NatWest and Lloyds in Rye, the only major bank left – Barclays – announced that they had no plans to close their branch. Today, Friday, January 18, however a letter (below) was received by Barclays customers advising that the branch will indeed close on Friday, May 10, but easing the pain with the good news that they could use the nearest alternative branch at Tenterden. This is 10 miles away, 20 minutes by car plus petrol cost or 40 minutes by bus plus fare. Inconvenient for the many businesses in Rye who regularly bank cash and cheques and no less inconvenient for some of the town’s older residents who may not be so keen on using the internet. However there is, Barclays say, an alternative which is the local post office where cheques and cash can be paid in (although they don’t say whether there would be any delay in clearing cheques when paid-in in this way). There are, of course, three other banks that have already sent the same advice to their customers so it will remain to be seen whether Jempson’s will have enough trained staff at their Post Office counter to avoid the build-up of lengthy queues and long waiting periods at certain times of the day. Nationwide is still open for business but deals in retail banking only at the moment although last November it announced that it was proposing to offer a business current account that would be suitable for small businesses. Image Credits: Kenneth Bird, Rye News library. In all honesty how many people actually NEED to go into a bank nowadays. Solutions such as using the post office create a good alternative. The article writer refers to queues but if you are too busy to queue then you’d already be doing your banking online like the majority of the population. This will make way for a much needed coffee shop or art gallery. What is just as worrying is the threat to the continuance of the ATM network, which is already reducing in size. We may become a totally cashless society in a few years, but we are not there yet and the prospect of towns such as Rye having no Bank Branches and no free ATM’s is an alarming one for many residents. About 25 years ago I was invited, as a journalist, by Royal Bank of Scotland to see their mobile minibus banking service in action in the Western Highlands and Islands. They were immensely proud of how they were bringing banking services once a week to remote communities, which had never seen a physical branch. Today, this is what Rye has become. Nationwide Building Society is a great beacon, and I hope they are able to see fit to offering banking services to Rye’s vital small and medium enterprises from their warm, static and friendly branch in the high street in the very near future. Awful news for elderly customers like me. I am seriously considering closing my accounts with Barclays and changing to Nationwide if they can offer equivalent services as the Rye branch of Barclays have to date. I don’t think I’m the only one. I began banking with Barclays in 1978, but it looks as though the time has come to part company. I think Daniel Carrick needs to consider all the local shops, the churches and other cash based businesses, who need change and be able to pay in bags of coins, on a weekly basis, well above the limits imposed by the post office. I have never understood why those who want a personal banking service (not business service) do not bank with Nationwide. It offers all the normal banking facilities for those who want personal banking services. It is the alternative to on-line banking which appears to be having its own problems with the advent of hackers and cyber incursions. I have banked there for 20 years. They offer competitive mortgages and loans if required. They are always very friendly and helpful. I would never change. You can pay cash in to your bank account at the post office. Most banks now offer a smartphone mobile banking app – using it you submit a photo of the cheque and funds will clear into your account by midnight the following day. The comments above are very true for residents but don’t take account of the needs of businesses or tourists. Business customers still require cash. Can they afford the time to travel to Tenterden or Hastings to pay in their takings or get cash floats? And what about the charity shops likewise? Rye’s population is swelled substantially by tourists and many may want to exchange money. Pity they will have got to the High Street before discovering the Nationwide machine is out of cash and the other ATMs are back where they started! Nationwide has yet to offer business facilities and the Jempsons Post Office service is already stretched. Good though it is I have queued for 15 minutes before now. While I have banked with Barclays for over 50 years I do almost all my banking online, so personally the loss would not affect me much not least as you can pay cheques in through the mobile app. And i have a Nationwide account. But Barclays have been somewhat dishonest in saying for months they had no plans to close the Rye branch and then reneging on that. And their letter is really only addressed to the personal customers. So I shall be writing to the Chairman to plead. I have recently been refunded by Barclays Customer Relations under the Banking Code, for cheques paid into the Post Office (not in Rye, I may add) which went missing after being paid in and a receipt issued. I have formally raised the point with both Barclays and the Post Office, that the information that customers need to sort such a problem is lacking. One is directed by the Post Office to Barclays and vice versa. Back and forth. I have banked with Barclays since the 1970s. The hassle and indeed the inconvenience caused by this issue and its investigation were both unbelievable and unnecessary. Barclays has advised that there is now the opportunity to pay cheques in online and I shall do this from now on. It is interesting that a manager from Post Office customer services stated in a telephone conversation that cheques, etc., are allegedly not sent in the “orange pouch” to the clearing centre in Northampton using a Royal Mail Tracked Service, and cited the example of about 50 enquiries a week re missing cheques. I still don’t know exactly what happened to my cheques and at what point in the clearing process they disappeared. I shall no longer be taking the risk. Barclays disseminates marketing material to customers when Branches are closed as part of its “Citizenship” strategy, but detailed and clear practical information on how to deal with issues such as the one that I have recently encountered, is wanting. It is reasonable to expect clear and accurate contact and process information to be readily available. This gives little consideration to those in our community who are either not IT literate and/or who cannot easily get to a Branch, and who will need to bank at Barclays using a third party such as the Post Office. It is my view that all customers and especially the older generation and those with special needs within in our community, for whom the former may be particularly applicable, need respect and care from High Street Banks which seek to adapt customers’ banking experience to accommodate their own corporate performance. 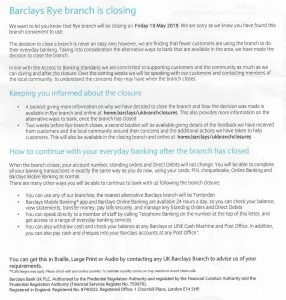 Ironically, on the same day that I received a letter from Barclays regarding my complaint, another letter from Barclays announced the surprise news of the closure of the Rye Branch. I’m sorry to hear that this branch will close but it’s not really a surprise. One comment that I would like to make is that in the several years I have used this branch I have found the staff there to be universally efficient helpful and pleasant and wish them well for their futures. As an elderly ‘Luddite’, and I know I am not alone, I do NOT want , nor will I , bank online ! I do NOT want to go to another town to do what I should be able to do locally. I would like to see Rye return to being a busy, lively , pleasant place to live and shop in. Losing our banks will be the death knell. It is not even a good place for visitors any more. Who wants shops filled with pot pourri and candles,( both incidentally bad for the environment), instead of more decent wet fish shops, butchers and green grocers etc? If the residents are happy and get what they need locally, so will the visitors be! Rye needs to return to being a place to LIVE in, not a place to apologise for. Give us back our Banks and book shops! Nationwide might well provide an excellent basic banking service, but see what happens if/when you need to open an Executor’s Account.